Psychology plays a vital role in any marketing strategy and a marketer who overlooks this factor is considered a failure. This blog discusses various conversion psychologies that you can use over oval magnets 4X2.25 for building influential marketing campaigns. Being a “human marketer” you are sure to make mistakes, but for success, you should overlook them and start building advertisements, which really influence people with its simplicity. Try to offer people who they understand the best. You can simplify their buying experiences by saying you are the only marketer who cared for what they loved. For example – Recently a popular e-commerce retailer tested with “Add to Cart” button on their website and tested with the symbol of the cart and + cart for some products. The surveys suggested that people opted for products with “Add to Cart” button because they were familiar with the concept. Similarly, you can convince them to buy it from you over these customized oval magnets by using some symbols, wordings, or graphics, which trigger their experiences. Have you ever wondered, why do we remember happiest and painful occasions? Because they have certain influences in our life. You can create advertisements over 4×2.25 magnets, which suggest happiness and pain. Have you recently seen television advertisements, which harp on smiling faces? Have you noticed some advertisements, which address your pain and offer solutions for them? Why are advertisers trying to create such marketing campaigns? Because they understand, human customers understand the feeling of joy and sorrow than any other species on the earth. Use 4X2.25 oval magnets for creating experiments that reflect happiness and pain (do not emphasize on this theme, but only link it for encouraging people to use your product). It may inspire you to ask – how people survived in the age of barter system? It is quite human to see things with the perspective of cost savings. People are always interested to know how much they may save on their current purchase. No wonder, marketers are keen to reap benefits by offering discounts, special sale savings and organizing shopping festivals. You sound more real and fair by saying – Save on art setup, shipping and branding. Grab your favorite product at half price, etc. Loyalty is the powerful word and being human it is quite natural for us to expect some loyal connection throughout our life. You can inspire them to become committed follower of your brand over these customized oval magnets 4x 2.25. Inspire them to spread the word and win great rewards by getting associated with your brand. Sound positive throughout your advertisement. Create advert that triggers optimistic thoughts within the viewer every time he sees it. Magnet advertising is the one and only marketing strategy, which allows you to experiment with all conversion psychologies to excel in the market place. 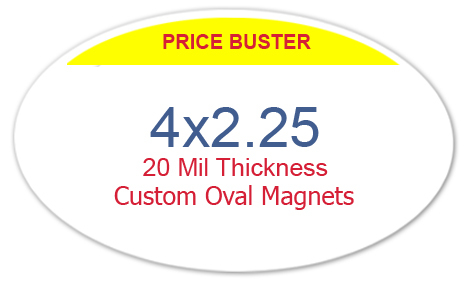 By sourcing these oval customized magnets 4x 2.25 from a reputed online e-commerce store, you are set to save on branding, shipping, and reputation!